FLORHAM PARK, NJ – Long time former Jets center Nick Mangold officially announced his retirement today. The 34 year old Mangold was cut by the Jets in February of last year after eleven seasons with Gang Green due to a lingering foot/ankle injury. The injury continued to hamper Mangold after his release which led him to sitting out last season. He announced his retirement on Twitter earlier today. Mangold originally was a first round draft pick by the Jets in 2006 out of Ohio State with a pick the team acquired from Atlanta for DE John Abraham. He was the heir to another long time Jets center, Kevin Mawae. In 11 seasons, Mangold was a rock at the position, starting 164 games and only missing 12 games during that time, most of them (8) in his final season due to his ankle injury. Mangold made the Pro Bowl seven times as a Jet. 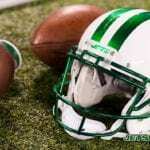 Mangold will sign a one day contract with the team sometime next week and retire as a NY Jet. He will always be known as an all-time great Jets player and for sure will end up in the Jets’ ring of honor and perhaps in Canton.